The first version of Internet Explorer borrowed from the source code of what other web browser? The creator of Internet Explorer Thomas Reardon is said to have used source code from Spyglass Mosaic, a licensed version of NCSA's Mosaic browser. Despite being derived from NCSA's Mosaic, the Spyglass version of the browser didn't use any of the code, according to its project lead Eric Sink, who detailed his memory of the events in a blog post. "Internet Explorer 2.0 was basically Spyglass Mosaic with not too many changes. IE 3.0 was a major upgrade, but still largely based on our code. IE 4.0 was closer to a rewrite, but our code was still lingering around -- we could tell by the presence of certain esoteric bugs that were specific to our layout engine," Sink says. 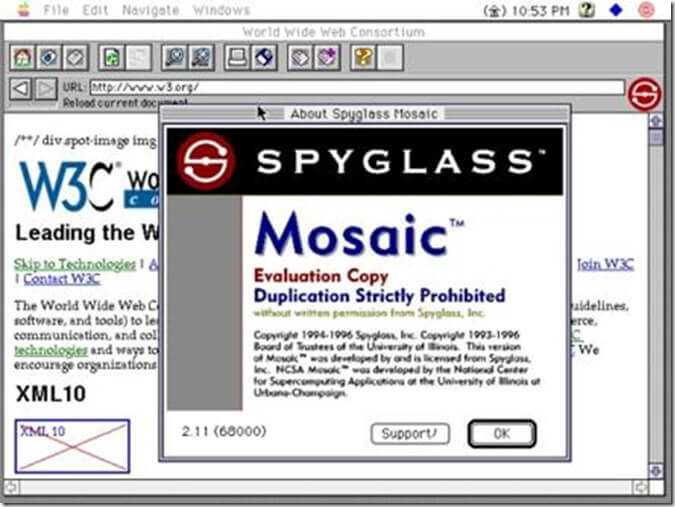 In 1994, Microsoft licensed Spyglass Mosaic for a quarterly fee plus a percentage of Microsoft's non-Windows revenues. However, the OS developer attempted to avoid those royalties by including Internet Explorer 1.5 for free in Windows NT, concluding in a lawsuit and an $8 million payout in January 1997.